The Civil War Classics series from Trans-Mississippi Musings brings the best of the works by authors who were present during the American Civil War in those states and territories west of the Mississippi River. These are public domain works, which I have reformatted as eBooks. 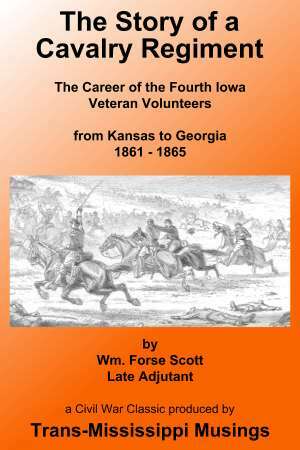 This is the history of a northern regiment from Iowa: The Story of a Cavalry Regiment: The Career of the Fourth Iowa Veteran Volunteers from Kansas to Georgia 1861-1865 published in 1866 by William Forse Scott. Scott writes about the service performed by the Fourth Iowa Cavalry Regiment in the American Civil War. I discovered this book because the Fourth Iowa was part of a cavalry brigade that fought in the battles in and around Westport during Price’s 1864 Missouri Raid. William Forse Scott was resident of Fairfield, Iowa when the American Civil War began. On August 10, 1861, he mustered in as a Private in “Sears’ Rangers,” which became Company A in the Fourth Iowa Cavalry Regiment. In November of 1862, he received a promotion to Hospital Steward for the regiment. Scott received another promotion as Sergeant Major of the regiment in August of 1864. Finally, in January 1865, Scott was appointed to regimental staff as an Adjutant. Scott mustered out of volunteer service on August 10, 1865, having served for the duration of the war in the Fourth Iowa Cavalry. In addition to being a regimental history, this book is also an homage to the regiment’s commander, Edward F. Winslow, who “earned the love of his subordinates … [and] the confidence of his superiors”. Scott's anecdotes about life in camp are compelling. Scott also describes the odyssey of Private Charles H. Smith and his buddy Private James H. Davidson, who went looking for a frying pan one afternoon. The two of them were captured by a scout of Confederate cavalry. Smith was able to escape and travelled 200 miles through enemy territory before getting safely back into Union lines. Davidson was not so fortunate and spent 15 months in prison, some of the time in the infamous Libby and Belle Isle prisons in Richmond, Virginia, before being transferred to Andersonville in Georgia. Scott provides detailed description of the conditions faced by the cavalry. When they were on an expedition, they had to be concerned about food and water for themselves, but also for their horses. At the beginning of the war, each cavalryman carried lots of equipment, not knowing which was important and which was not needed. But all the equipment meant the horse had to carry that much more weight. So over time they learned to carry only what was necessary for the expedition’s success. The regiment participated in Grant's Vicksburg Campaign and Sherman's Meridian Campaign. They played a key role as rear guard protecting the Federal retreat in the Battle of Brice's Crossroads (or GunTown). They entered northeastern Arkansas in September to operate against Sterling Price, supporting an infantry division commanded by Major General Joseph A. Mower. Getting a late start, they were unable to catch up with Price's army. But in October, the Fourth Iowa Cavalry, serving as part of Winslow's Cavalry Brigade, reached Independence, Missouri on October 22, in time to attack Price's rear guard. The next morning, they fought in the Battle of the Big Blue at Byram's Ford. And of course, the regiment founght in the decisive Battle of Mine Creek on October 25, 1864. In the spring of 1865, Winslow's command, including the Fourth Iowa Cavalry, was part of the Great Cavalry Raid into Alabama and Georgia, led by Major General James H. Wilson. During this campaign, Wilson’s cavalry defeated Nathan Bedford Forrest at Ebenezer Church, Alabama. They captured the important towns of Selma and Montgomery, Alabama and Columbus, Georgia. While they were preparing to move against Macon, Georgia, they received word that Richmond, Virginia had fallen and Lee and Johnston had surrendered. It was April 20, 1865, and the war was over. The next few months would be spent performing occupation duties in Georgia. Then in August 1865, the Fourth Iowa Cavalry received orders they were going to be mustered out of service. According to Scott, it had been “four years and one day since the first company, was organized.” They were finally going home to Iowa.